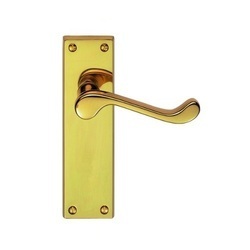 We are engaged in offering a quality approved range of Lever Latch Brass Ornet. Our company has gained wide spread reputation in the manufacture, supply, trade and export of Door Lever Latch. Available in exclusive range of size, shape and design, these latches fulfill all requirements of our clients. These are made by using supreme raw material by our experts who have great knowledge in this field. Quantity per Container (Around 8, 000 to 10, 000 sets per container) : Packed in colored boxes with spindle, screws and wall plugs. We manufacture good quality product of Antique Door Lever Latch. We have gained immense recognition among clients by providing an excellent quality array of Round Lever Latches. We use finest grade material to design them with the help of our skilled craftsmen. These can be customized as per the specifications of the customers. Aluminum Door Locks Unfurling our collection of aluminum door locks that are known for their attributes of sturdy construction and fine finish. 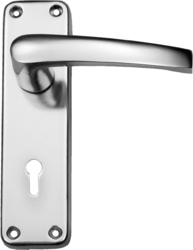 The aluminum door locks have a horizontal handle for operating the bolt of the lock that ensures the door is locked. The exquisitely casted shapes of our door locks add a personal touch to the room and speak a great deal about ones elite tastes. Our range of Door Handles (Pearl) is being used for door. This is being made from the Stainless Steel. This is being made in 19 mm thickness and with 150mm, 200mm, 250mm, 300mm etc. We are make Handles as per customer demand and specification. These are made from quality raw material and are durable, resistant to corrosion and have high tensile strength. Our products are also offered as per the specifications and details given by our clients and are used in various household purposes. Maxima products are elegant in design and smooth in touch, our door handle can match the varied types of doors and decor. The different door handles are precision engineered to provide the clients with a unique range that meets the clients needs.